Rescuers in Snowdonia were called out to investigate a mystery trail of blood on a mountain. 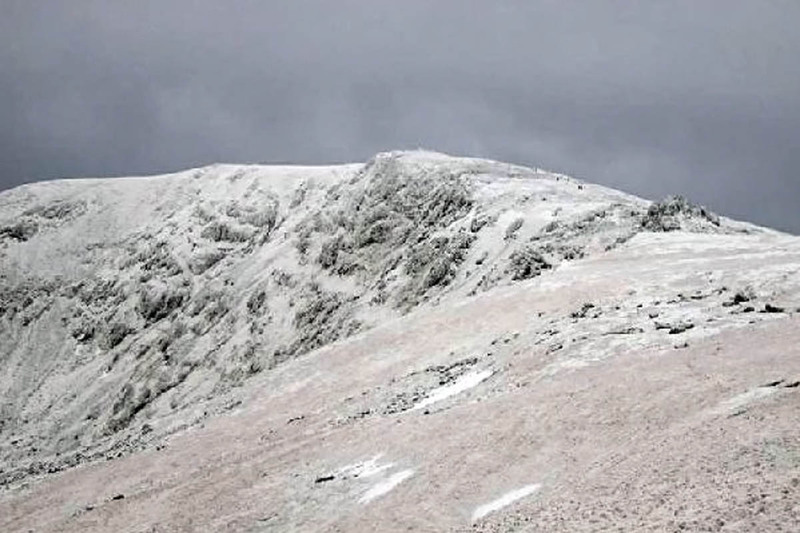 Two walkers on Carnedd Llewelyn made the discovery on Monday and heard dogs barking. The pair rang 999 as they were worried the dogs’ owner could be injured, but they could not see the dogs or follow the trail. Chris Lloyd of Ogwen Valley Mountain Rescue Organisation said: “The police called a team leader from OVMRO. “He was able to telephone the informants to request further information. Unfortunately, they were unable to give a grid reference. Due to the urgency and failing light, the assistance of the Maritime and Coastguard Agency’s S-92 helicopter was requested. “It picked up a couple of members from Oggie Base to act as spotters. They carried out an extensive search of the east side of Carnedd Llewelyn but found no person and no dogs. The incident was one of several that kept the team busy during the past week. On Saturday its members were called out to help a couple cragfast on a peak on the opposite side of the valley. Mr Lloyd said: “High up on the snow-covered Tryfan, a European couple, though both living in Cambridge now, became stuck. “They had successfully scrambled up the North Ridge but when encountering the North Tower, they moved to the left to bypass the difficulties. However, they eventually became cragfast and snowbound just above the Eastern Traverse. “The gentleman had climbed Tryfan before but this was the lady’s first outing on the mountains. Once stuck, they telephone Oggie Base directly having used their smartphone to find the telephone number. “The team leader assessed the situation: winter conditions with a stiff breeze, two people stuck high up on the mountain without full winter equipment, time lag to get the mountain rescue team mobilised and a team up the North Ridge. “Considering these factors, he requested the assistance of the MCA helicopter based at Caernarfon, via North Wales Police. The Ogwen Valley team was alerted again on Tuesday about 2.30pm when two men in their mid-20s called police to report they were lost and stuck on steep snow-covered ground and in low cloud on Glyder Fach. Mr Lloyd said: “The terrain did not match the route that they had planned. They had lost confidence in their navigation and needed assistance. “They were reasonably equipped and had a shelter to crawl into whilst they awaited rescue. The team leader was unable to use Sarloc to locate them as the phone was not a smartphone. “While initiating the callout, a second call came in reporting that a group walking down from Cwm Lloer which nestles between Carnedd Dafydd and Pen yr Ole Wen, had met a man with a leg injury. He had slipped earlier but was making his way, slowly off the mountain. “With two incidents now on going, the team leader requested the assistance of the RAF MRT based at RAF Valley. He also requested MCA’s S92 helicopter. With the arrival of both at Oggie base, the helicopter was used to uplift four Ogwen members to Cwm Lloer. Mr Lloyd said, in Cwm Lloer, the rescue party realised that they were well above the casualty party and had to descend to them. “Fortunately, the 63-year-old man successfully made his way all the way to the road without assistance at about 6pm. A valiant effort. “With the Cwm Lloer incident concluded, team members awaited a call from the Glyders to say that the two men had been located. The RAF team had to climb the southern slopes of the Glyderau in soft snow and dense cloud. “Traversing the rocky plateau to Glyder Fach and passing the Cantilever Stone, they found the bivvy shelter with the two men near the top of the screes adjacent to Bristly Ridge. The Ogwen Valley team has been called out 21 times so far this year.